Data Loggers which Indicate measure and record data with local indication. Some display right on the product face, but one product available is wireless. Covers a variety of applications. 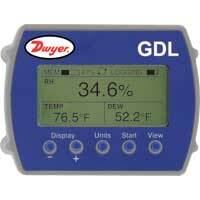 Graphical Display Data Logger can record and display temperature, humidity, and dew point trends. Has internal temperature and humidity sensors. Applications include medical storage facilities and wine storage. 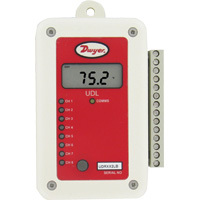 Universal Input Data Logger are available with 0, 2, or 4 universal inputs. Each input can be configured to accept a thermocouple, RTD, thermistor, voltage, or current input. Graphical Display Data Logger can record and display temperature, humidity, and dew point trends. Accepts up to 3 external temperature sensors. Applications include wine storage and greenhouses/ florists. Wireless Temperature/Humidity Data Logger is perfect for applications which require real time monitoring or areas that are not as accessible. Features a user programmable alarm.